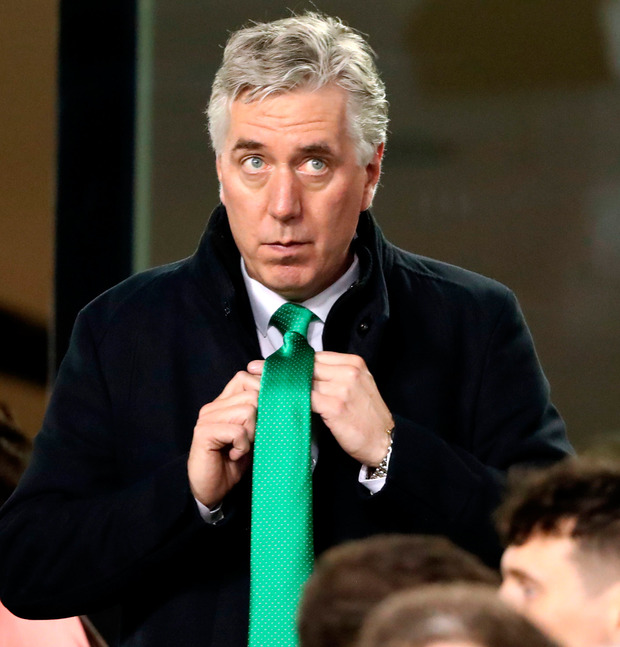 ‘Regardless of your view of John Delaney, it is indisputable that one person having — or appearing to have — so much dominance in an organisation is not good for business’ Photo: Niall Carson/PA Wire. It’s becoming a sideshow, this whole John Delaney thing. There he is in Gibraltar on the phone. There he is in the Aviva, with Emma. There he is in Limerick on one of his grassroots days, mixing it with members of the football family. John Delaney is a great man for Irish soccer; John Delaney must go. It’s all a sideshow. The tennis balls, the headlines, the banners, the loans, the woman, the rent, the salary . . . it’s all a sideshow. John Delaney is a curiosity in the small – and let’s face it, limited – landscape that makes up Irish celebrity life. He is the man who phones newspapers complaining about his privacy but kisses his girlfriend in front of tens of thousands of football fans; he is the man who feels he has to publicly deny he’s having a fling with a beautiful young model; he is the man who gifted Ireland a stadium. In some quarters, John Delaney is an extremely popular man and as much as many – especially in the media – find this distasteful, it is something that cannot be ignored because it doesn’t fit the ‘Delaney must go’ narrative. Like a wily old politician, he has steadily built up his support base over the years. He is streetwise, and understands his constituents and their needs. He has travelled the country, attending functions and all manner of club events; he has looked after these clubs in any way he could, up to and including financial assistance. There are hard working volunteers all over the country who will not hear a bad word said against him. They know he has faults, but who doesn’t? They are prepared to look past them because, in their hour of need, he was there for them. In the Rochestown Park Hotel in Cork last August he was the star of the show at the FAI’s annual awards night for the Irish football family. Here he was, with his people and there was no doubting what they thought of him. Like the local TD, or county councillor, he might seem out of step to the vast majority but that is of little consequence to him or his constituents. Because he knows how to win votes . . . So let us park this sideshow for now. At the end of the day, he was just the chief executive of the Football Association of Ireland. This meant he was answerable to a whole lot of people – in theory at least. He was answerable to the board of the FAI and, by extension, to the Irish football family. He was answerable to the executive of Sport Ireland, which is responsible for overseeing all of Ireland’s sporting bodies and for distributing public money directly to them. This in turn made him answerable to the board of Sport Ireland. By extension, this meant he was also answerable to the Department of Sport and the minister of the day. That’s a whole of people to be answerable too. But let’s state the obvious about the FAI: Regardless of your view of John Delaney, it is indisputable that one person having – or appearing to have – so much dominance in an organisation is not good for business. While the mob is baying for blood, a lot of people involved in Irish sport are scratching their heads and wondering how is it that an Oireachtas committee has summoned the FAI in to answer questions now? Why has it taken the recent revelations, sparked by The Sunday Times reporting on a €100,000 bridging loan from Delaney to the FAI, to prompt action from the Oireachtas Committee for Transport, Tourism and Sport. Before that, there had been questions at board level in Sport Ireland around the FAI’s finances. Guarantees were sought – and given – that money from the public purse was being spent on the projects it was allocated for. There were raised eyebrows, too, on the many occasions when the FAI would come calling early in the year looking for an advance on its allocation, sometimes even before a final figure had been decided by Sport Ireland. The questions have been swirling around for years. ‘A number of governance issues are raised in the case of the FAI. The Genesis Report was produced 14 or 15 years ago. It contained a number of recommendations which ended up not being implemented, including that independent non-executive directors be appointed. Why was that the case? It was a big initiative after the events in Saipan and should have fed into the area of governance. Recently, the age until which people could serve on the board was extended beyond 75 years. Some people have been members of the FAI board for many years. Turnover is very important to bring freshness and avoid groupthink. It also helps good governance. Things that are not desirable in terms of good governance are jumping out at me. Will Mr Delaney address this range of topics? Murphy introduced the areas of governance and finance into the session but it is a failing of this hearing system that it is difficult to drill down into issues like this in the time available, unless that is, more members of the committee take a similar line of enquiry. That didn’t happen that day. In 10 days’ time, John Delaney will lead an FAI delegation to this Oireachtas committee, and all of the noises in the lead up is that the tone will be different this time. Before then, on Wednesday next, Sport Ireland will appear before the same committee, led by chairman Kieran Mulvey and chief executive John Treacy. This may not garner quite the same attention as the FAI visit, but it is nonetheless an important outing. It may even be more important, because the events of the last few weeks have shone a light on some cracks in the Irish system. It is true that governance and accountability in Irish sport has improved immeasurably in the last five years, but equally, Sport Ireland’s influence is greatest on those sporting organisations which rely heavily on it for funding. The so-called big three – GAA, FAI and IRFU – do not rely so much on Sport Ireland; they are largely self-sufficient. This is not to say they would like to lose their public funding – which for the FAI totals almost €3m a year at the moment. It’s just that they could probably scrape by without it to a degree which all the other sporting bodies most assuredly could not. And this is what allowed Sport Ireland to seek to affect change in those smaller associations, insisting that they have their house in order when applying for funding. When it came to the big three, however, this did not necessarily apply and as a result there is a question mark around governance in all of them. In the FAI this centres on the dominance of one individual and the compliance of the board, while in the GAA and the IRFU it centres more around their management structures and also the role of women. So, for Irish sport, Wednesday’s hearing is of some significance. You can be sure it will be followed with interest by many involved in the day-to-day world of all the various Irish sporting organisations. Sport Ireland’s delegation will be quizzed about what level of knowledge they had about some of the recent revelations and what – if any role – it plays in resolving the governance issues in the FAI. The committee members, though, may find that Sport Ireland’s powers in this area are not as broad as they might have hoped. And yet . . . it’s time for some answers. From a lot of people. Today is the last day in March, and for many inter-county footballers, there are only two meaningful games left this year with their county. Those players who are beaten in the first round of their provincial championship, and then the first round of the qualifiers, will be flogged to death in the weeks ahead . . . for what? Take yesterday’s finalists from Division 4, Derry and Leitrim, who both have difficult upcoming assignments in the opening round of the championship. Derry face a Tyrone team being touted in some quarters as a possible threat to Dublin’s five-in-a-row ambitions, while Leitrim have to travel to Roscommon, against whom they have a woeful championship record (one win and one draw since 1994). As it happens both games are on the same day — May 12. After the highs of a high-profile final in Croke Park yesterday, these opening round games could easily represent a crash back down to earth for Derry and Leitrim. One hard draw, or one bad performance later, and that could be it for the year. And there are so many other teams who face the same prospect. What is all the training for? What is the point of it? The tinkering around the edges of the championships — football and hurling — has made no material difference to the lot of players. Cramming the season into blocks that place huge demands on players has not worked. The GAA’s defence is that the changes are to the benefit of clubs but this does not stand up to scrutiny. The idea largely promulgated by managers that the club and inter-county seasons could not run hand in hand, as they used to, has been allowed to take firm hold to such an extent that it is now dictating policy. The leagues had to be finished early to create an artificial ‘club month’ in April, and the All-Ireland finals had to be brought forward to allow more time for counties to complete their club programmes. But this is not what clubs wanted. It is not what they asked for. Clubs wanted a proper fixtures masterplan, a national programme of games, which allowed for a well planned and structured inter-county season and clear and defined windows within that for club players to enjoy meaningful games. Of course this is not an easy thing to do. It’s a difficult balancing act — but there’s nobody who thinks it is easy. You could argue that the GAA took the easy way out with the changes they brought in rather than grapple once and for all with this thorny issue. Instead, there is chaos. Take another one of yesterday’s finalists — Meath. There is a lot of optimism in the county following an impressive league campaign which brought a return to top-flight football for the first time since 2006. It’s a big step forward. Finally, there is a sense in Meath of progress being achieved. But beneath this wave of optimism and goodwill towards Andy McEntee’s team there is a thinly-veiled layer of frustration at how club competitions in the county are being run. Clubs have been slogging away through the dark winter evenings since Christmas and, last weekend, the sixth round of the football league was completed. The fourth round of the hurling league is fixed for today. By this weekend, the third round of ‘B’ league games will also be completed. On some weekends, during the worst of the recent heavy rain, clubs played A and B league games on consecutive days, testing the playing resources of more rural clubs to the limit and destroying pitches, forcing many to be shut for a spell to let them recover. Meath will, in the coming weeks, play two rounds of the club football championship. So, if your club gets off to a bad start in the league and championship, your season is effectively over before the end of April, leaving you bereft of meaningful games for the rest of the year. Indeed, in the county’s masterplan for 2019, the A and B league finals are scheduled for early July. There’ll be no problem minding pitches after that weekend. They’ll be largely empty. These league games belong in the spring and summer months, when the evenings stretch and the average club player is motivated to play. And it is this player — the average club player — who is being let down in so many counties. In Cavan, the club season only begins in earnest this weekend with the opening round of league games. A player from Meath Hill, near the Cavan border, tweeted about this contrast last week, noting they would be playing in good conditions, “not muck, gutter, wind and rain like we’ve been slogging in since our first round at the end of January”. All over the country, players are not being served well by those who are responsible for running football and hurling. The situation in Meath makes no sense, and is mirrored elsewhere. The national scene makes even less sense. Still, we rumble on . . .
From hardened hacks to hard-to-please punters, the reaction to Ireland’s win over Georgia last Tuesday night seems to have been along the lines of, ‘never mind the score, that was bloody enjoyable’. There seems a willingness — you might say an extraordinary willingness — to overlook the fact that it was just a 1-0 home win over a team currently ranked 91st in the world. But it wasn’t the win that has people buzzing, it was the manner of it. Those who were in the stadium were enthused by what they saw. They enjoyed the game. They enjoyed the way Ireland played. Those who watched at home probably waited until half-time to put the kettle on. I’ve heard it said more than once in the last few days that if Mick McCarthy’s Ireland keep playing in this way — on the front foot, passing the ball — it might even make defeats more palatable. And, let’s face it, with that team defeats are inevitable. But if we die with our boots on, the fans won’t mind so much apparently. Which is all fine, I guess, until we die with our boots on . . . then we’ll see. A mobile high performance centre — now there’s a novel idea. Hats off to the Irish Sailing Association, which recently opened their new base in Dún Laoghaire, for coming up with it. Their new base is entirely mobile. It cost €300,000 to construct and consists of three converted shipping units which have been specially kitted out so that there’s a gym, an area for gear storage and boat maintenance, and a team meeting room which will be shipped to Japan for the Olympics next year. For now, 13 sailors will be based at there, making it the latest sport to find a way of keeping top athletes at home rather than having to find the funds to move abroad to improve. As Annalise Murphy said, the new HQ “means we don’t need to rely on the nomadic overseas campaigns of the past”. It was funded entirely by the Irish Sailing Foundation, which has been extraordinarily successful in raising funding through philanthropy. It is no coincidence when innovation in a sport behind the scenes leads to breakthroughs on the international stage. That’s what has been happening in sailing, with its culture of success, and will continue to happen. What a few months it’s been for the Mulligan clan. Emlyn Mulligan made his debut for Leitrim in 2008 but yesterday was the first time he got to wear the green and gold on the Croke Park turf. Mulligan — who was married recently — has been an eloquent advocate for players from the lower-tiered counties and it was great to see him with his county team in Croke Park, knowing how much it would have meant to him. His first cousins, Shane and Francis Mulligan, meanwhile, lined up alongside each other in the half-back line as part of Mullinalaghta’s fairytale journey to the All-Ireland club semi-final.